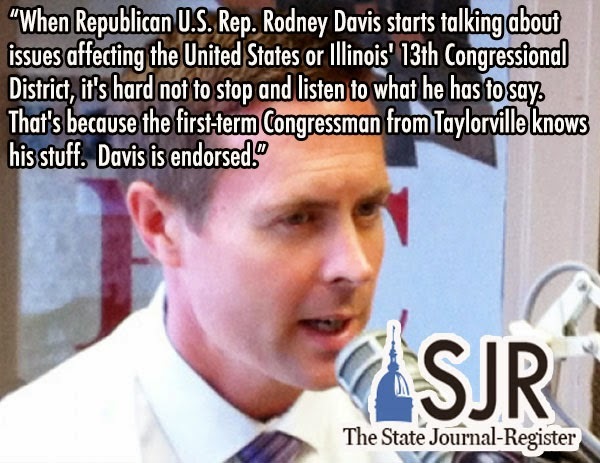 The Springfield State Journal-Register comes out swinging with a *very* strong endorsement of Congressman Rodney Davis this morning. They say that Davis is knowledgeable and deserves another term and that he's far-and-away a better candidate that his challenger Ann Callis. When Republican U.S. Rep. Rodney Davis starts talking about issues affecting the United States or Illinois' 13th Congressional District, it's hard not to stop and listen to what he has to say. That's because the first-term Congressman from Taylorville knows his stuff. He can explain complicated issues, he understands the needs of the 14 counties that make up the 13th, he works hard at the role he was elected to in 2012, and he's happy to stop and visit with anyone about what's happening in Congress — and not just during campaign season. ...But he has shown a desire to set aside partisanship and instead work with lawmakers on both sides of the aisle to get things done. He points to his work on the controversial Farm Bill last year as an example, saying he was criticized by the right for his vote. “I believe no bill is perfect and there are times when you have to sit around a table and work toward a common sense solution,” he told The State Journal-Register editorial board last week. He noted that the 13th is split among Democrats and Republicans, something that is reflected in his voting record. Indeed, based on his votes, Ballotpedia identifies him as a moderate, right-of-center Republican. Davis also exhibited thoughtfulness and growth as a public servant when he admitted he learned a lot from last year's frustrating 16-day government shutdown. “I think many of my colleagues on both sides of the aisle learned a lot, too, and it's something I never want to see again. Don't get me wrong, it took both parties to cause the government to shut down, but it took both parties to end it,” he said. Much of Davis' confidence and knowledge of national and local issues comes from the 16 years he worked as an aide to U.S. Rep. John Shimkus, R-Collinsville.